With winter on its way, preventive health care is on the mind everywhere. Wellesley students drop by the Health Service for flu shots, regularly take advantage of opportunities for hand sanitation, and make strong choices in dining halls in order to prevent being sidelined by pre-finals illnesses. And yet, in these venerable halls, an incurable disease persists: Potter fever. At relatively stable levels since the release of the final book of author J.K. Rowling's seven-part series (Harry Potter and the Deathly Hallows) in 2007, a spike in the malady was expected with the recent release of a new piece by Rowling elucidating the life and times of the notorious Dolores Umbridge. Umbridge, who could be described as a Wellesley student gone bad, terrorizes Potter throughout books five through seven, and is one of two people able to leave a scar on Harry, the other being the novel’s antagonist, Lord Voldemort. The new 1,700 word essay was released through Rowling’s Pottermore.com (a website dedicated to all things Harry Potter) on Halloween as a treat for users. Neither a prequel nor a sequel to the series, it serves to broaden the understanding of Harry Potter by providing a back-story to explain the makings of an educational and bureaucratic monster. Potter fever at Wellesley discriminates against none and afflicts many. The infected are typically seen with noses glued to the books of J.K. Rowling, often in some degree of sleeplessness. 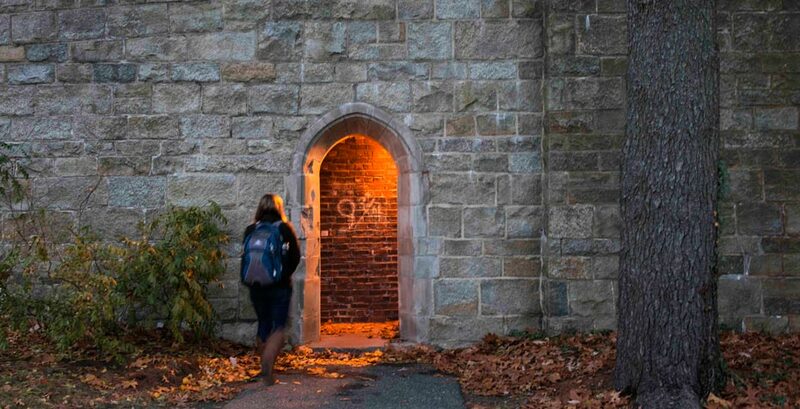 Wellesley students are so ardent for the stories of Harry Potter and his friends Ron and Hermione that they have designated a mysterious-looking passageway near Green Hall as “Platform 9¾.” Students and visitors alike are enthralled by the resemblance of Tower’s Great Hall to the Gryffindor common room. Even now, until the end of the semester, a display in the Arboretum called "Ollivander's Garden" identifies the various trees whose wood was used for making wizarding wands in the fictional series. (Look for the white labels with the black and yellow ribbons.) Wellesley's Botanic Gardens exhorts students: "Send us a picture of yourself in a Hogwarts uniform next to a wand wood tree to win a prize!" Wellesley also has an active Quidditch squad, which competes year-round, according to Joanna LaPerriere '17, president of the Whomping Wellesleys Quidditch Team. "Our last game of the semester was a tri-meet on November 9 in Providence against Clark and the Providence Ashwinders (a team of Brown and RISD students), but we continue to have practices, as games resume in March." Plus it's fun. Wellesley College students have been playing Quidditch since 2010, when Claire Merrill '12 and Naomi Takaki '12 founded the club on campus. In addition to regular Quidditch practices and competitions, the Quidditch team has organized such activities as Harry Potter immersion day, midnight movie premiere outings, a trip to the Quidditch World Cup in New York, Halloween costume parties, and a debate on the matter of which Hogwarts house various Game of Thrones characters would belong to. The team is going strong as it enters its fifth year. Says LaPerriere, "We have been very lucky this year to gain many first-year players, and are playing better than we ever have before. We have a great sense of team cohesion and family." While one might argue that the campus is dominated by Ravenclaws, Wellesley students are certainly fond of one Gryffindor hero and his strong female cohort.